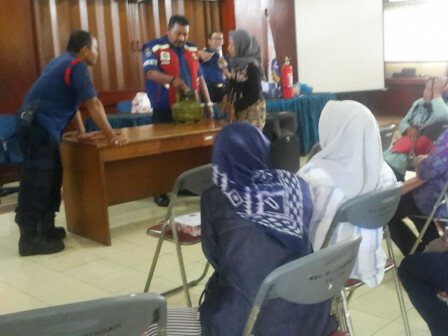 Some 25 cadres of Dasa Wisma (a long-running social program organized by housewives) living in RW 02 and 05, Penjaringan Urban Village were taught how to install a gas stove and use an electricity network as fire anticipatory, starting from hoses, regulators and gas cylinders.
" It is very useful for those who live in densely populated areas"
"It is very useful for those who live in densely populated areas," said Penjaringan Urban Village RW 02 Dasa Wisma Coordinator, Pujawati (53). North Jakarta and Thousand Islands Fire and Rescue Sub-agency Head, Satriadi Gunawan explained, to them, his ranks explained about the home electricity system, which triggers fires and needs to be anticipated, including the use of electrical installations, which comply with specifications. Along with firefighters, those cadres would conduct an inspection, especially for houses which are prone to fire by giving stickers," he said.